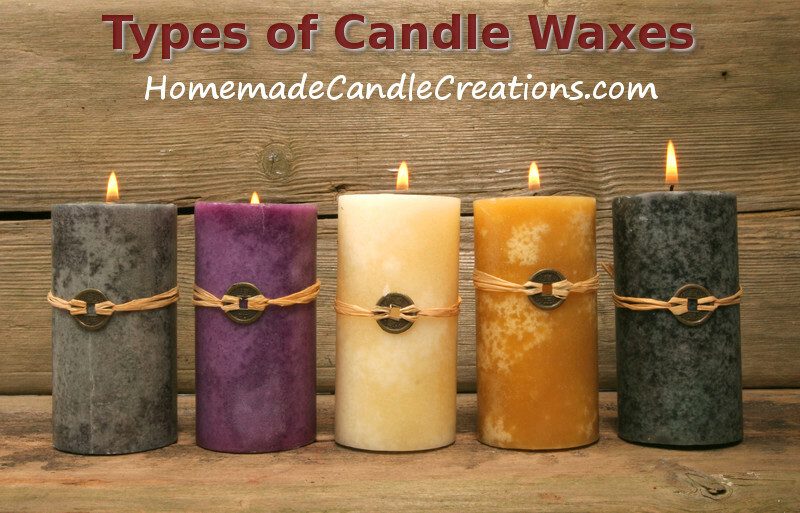 Knowing the different types of wax for candle making may seem like a no brainer to those that have been making candles for awhile, but we all had to start at the beginning! There was a time when I thought those gel candles I saw in the store were soy wax 😉 I knew about beeswax, but I never knew there were palm wax candles, coconut wax, etc…. so don’t feel bad if you don’t know a thing about any of these waxes! Can candles be made out of any kind of wax? The short answer is no. There are waxes that are made for coating packaging. There are waxes made for waxing cars. There are food grade waxes that coat some fruits such as apples, and some cheeses are wrapped in wax. There are all kinds of waxes out there! Many waxes that are in use today are made from petroleum. Paraffin wax is a candle wax made from petroleum. The difference in paraffin wax from other types of waxes is that paraffin wax is made of smaller molecules and has a lower melting point. Paraffin waxes are used to make candles, wax paper, cosmetics, medical ointments, lubricants, electrical insulators, matches and many other products. Regular waxes are used to make adhesives, printing ink, laminated paper, coatings and many other products as well. Some may disagree, but according to some sources paraffin wax as well as other candle waxes are non toxic. Paraffin wax is even approved by the United States Food and Drug Administration for use in cosmetics, medical applications and food. I would like to add that there are apparently lower grade paraffin waxes that may contain more toxins, so if you are concerned about this when purchasing your wax, you may want to find out if your candle wax is food grade. There are also other opinions that any paraffin wax, even food grade, is toxic. It’s something I am not going to debate here, but I just advise that you do your research and do what you feel comfortable with. What kind of candles can I make with paraffin wax? Pretty much any kind! You can make container candles, pillar candles, taper candles, birthday candles, votives, tealights, wax melts, carved candles and so on. You can also mix paraffin with other natural waxes like soy or beeswax. Onward to natural candle wax! If you are interested in going the more natural route without the fear of toxic chemicals in your wax, there are several natural waxes out there. These, however, are going to be more expensive than paraffin wax. For candle making, you will find yellow beeswax and white beeswax. Coconut wax is made from coconut oil. It is a very soft wax that cools to a nice consistency and, from my experience, has a better hot throw than soy wax. Coconut wax is suitable for container candles only. Since it is so soft, it will not work for making free standing or molded candles such as pillars, votives or tarts. The main concern with coconut wax is that it has such a low melt point that it is not ideal for warmer climates. Coconut wax can be mixed with soy waxes that have a higher melt point. Mixing with soy wax can also help control frosting that is common with soy, and improve the hot throw in soy. Soy wax is derived from soy beans. Soy wax is the least expensive of the natural waxes which is why soy candles are so prevalent now. Soy candles burn up to twice as long as paraffin candles (Yes, I have tested this myself! ), and generally burn cleaner as long as they are made properly. Soy beans have been used for thousands of years, so it is not a new crop, though making candles with it is more recent. Click here to read more about soy wax and candle making. Palm wax is a very hard wax that is wonderful for pillar candles as well as containers. Palm wax has a higher melting point, 140 degrees F. which allows the candles to burn more slowly, and palm candles can withstand summer heat well. Palm wax is very unique in that it has a crystalized/feathered texture when poured at lower temperatures. Palm wax candles are very beautiful and you can make some very interesting color combinations with them!